Published by Wilmer Atkinson Company, Philadelphia, 1919. Cover is worn, spine is frayed. Covers are barely attached to body of book. Inside pages are mostly nice and clean. Several pages are loose. Several pages have pencil marks. No map. 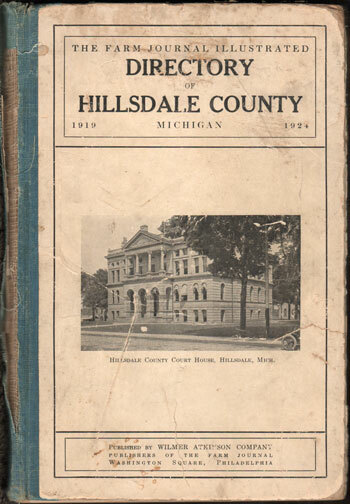 A directory of the residents in Hillsdale County, Michigan that includes the name of head of household, name of wife, occupation, number of children, and address. Hardbound, 288 pages. Also includes numerous business ads.